Whether you select simple, single-note essential oils or complex natural with essential oil blends, Scentsy Oils infuse your space with artisanal, natural fragrance. Designed for use in a Scentsy Diffuser. Harvested from the most fragrant botanicals in the world, our pure essential oils deliver a singular fragrance. Combine with other Scentsy Oils to create a personalized sensory experience. 15 ml each. What is the difference between Scentsy Essential Oils, Essential Oil Blends and 100% Natural Oils? Scentsy Essential Oils consist of a single essential oil. Scentsy Essential Oil Blends are blends of two or more essential oils. Scentsy 100% Natural Oils are blends of two or more natural and essential oils. All Scentsy Oils are 100 percent natural and naturally-derived; no synthetic ingredients are used. Can I ingest Scentsy Oils or use them topically? No. The FDA does not approve or recommend ingesting or topically applying any essential oil. Though many essential oils are on the FDA Generally Recognized as Safe (GRAS) list and all Scentsy Oils are safe and meet all Research Institute for Fragrance Materials (RIFM) standards as diffuser oils, Scentsy Oils are not intended for ingestion or direct skin applications. 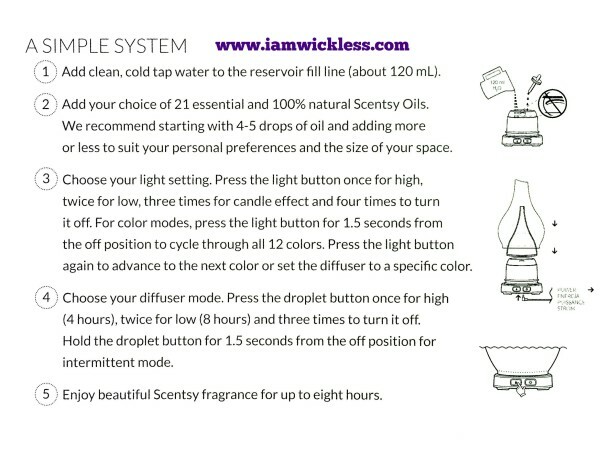 For our FAQs on Scentsy Oils and Scentsy Diffusers, click on the provided links. With our essential oils and diffusers, your getting our most personal fragrance experience yet. Simply add water and your favorite Scentsy Oil to the diffuser reservoir (start with 4-5 drops, use more or less oil to customize your fragrance intensity) and choose your light and mist options. The Scentsy diffuser releases your perfect fragrance, carried in a microscopic mist, for an exclusively natural, full-bodied, immediate experience precisely matched to your desires.